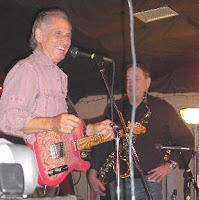 he graduated from northeast high school in 1962 and played locally with johny ware and others, attended ou and taught guitar, before leaving school and town to tour with conway twitty in the first days of his rock and roll times. 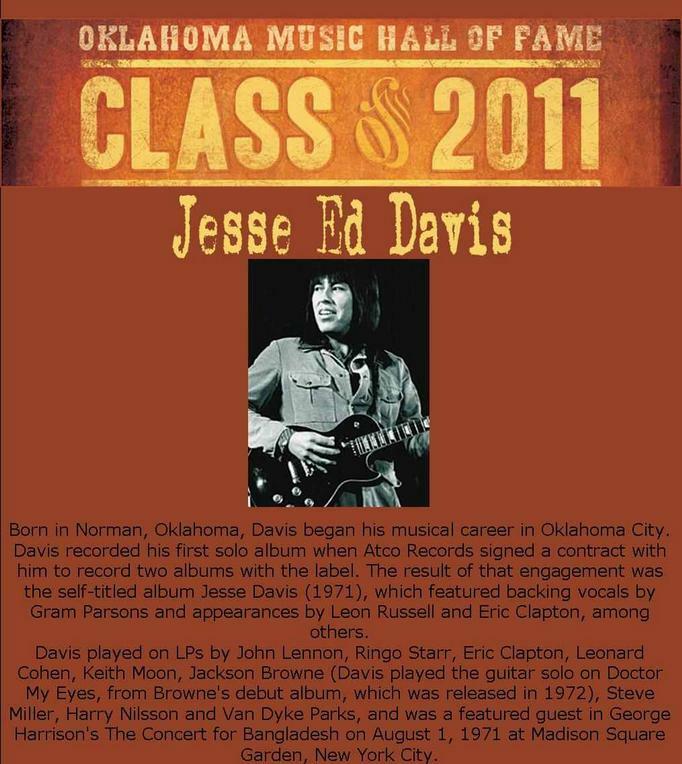 his life is chronicled by rock historian jas obrecht in part because of the list of rock superstars with whom he was associated from taj mahal to individual beatles: Jesse Ed Davis: “I Just Play the Notes That Sound Good”. near the end of his life at 43 he played with john trudell in the graffitti band. one night in 1987 while playing in the palomino club with taj mahal they were joined spontaneously on stage by bob dylan, george harrison and john fogerty producing what turned out to be a particularly special tribute to his career and ability. wes reynolds, known as wesley during high school years, grew up around oklahoma city and spent time at northeast high school in the 1950's and according to my memory at least performed at my high school, northwest classen. i can remember him still for having the famous 'greaser/rocker' look and playing his hit 'trip to the moon' in the northwest classen high school cafeteria. his memory stuck with me all these years and i went internet searching for him and found that he was live, well and still playing in tulsa after some heady musical times of his own. turns out he had abandoned high school [a move i wouldn't have understood at the time] to began a musical career described by his friend john wooley in a tulsa world article: Wes Reynolds has been all over America -- on and off the rock 'n' roll radar. i found that he had honed his musical skills in part at a studio run by one of child musical heroes about 100 feet from where i now live. he used to venture to the legendary studio of gene sullivan in capitol hill. sullivan as gene of 'wiley and gene' had been a local musical hero for me for as part of their bluegrass/country singing and comedy routine. his studio up the block from me now was obviously a local music epicenter featuring appearances by the likes of leon russell before he was leon and others. and wes got to play with them all. but i didn't know all that firmly north of the south canadian river. 'trip to the moon' was the result of a somewhat byzantine story of music in the first space exploration days of the 50's. 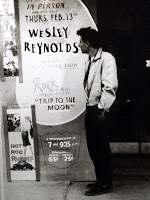 nonetheless it's publication in 1957 officially began wes' rock and roll career with 'the house rockers' and other bands and took him to venues from tulsa's hard rock scene to a good part of the united states. a south dakota rock and roll association notes his playing there and being part of the bands listened to and brought there by oklahoma city's KOMA as a clear channel station. wes lived in los angeles, las vegas and miami and played with rock and roll blues legends as diverse as ricky nelson and bo diddley. he even appeared in television shows during his l.a. days. in 1970 he returned to tulsa to raise a family and continue music as a documents his touring and tulsa years. his current web site showcases his entire career. he is an accomplished rock and roll pianist, ala jerry lee, and blues guitarist. 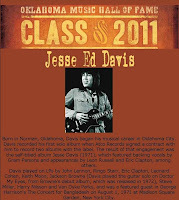 in 2009 he was inducted into both the oklahoma historical society rock and roll hall of fame and the oklahoma blues hall of fame. ** a tulsa fan, 'nurseeroc' has given included a number of wes' videos on his youtube channel. earlier this summer he wrote, produced and performed a new video 'for good'. i finally got to see wes perform one song in tulsa earlier this year 50+ years after that school cafeteria and am eagerly awaiting a next time. he wrote to me this morning and reported he and jesse ed traded guitar licks and rock and roll star dreams in oklahoma city in their teens and saw each other shortly before jessie ed's death. so today i happily celebrate two of my oklahoma city contemporaries who followed their rock and roll dreams. * suffice it to say that conway twitty has not been in made a member of any oklahoma hall of fame musical or otherwise and that is just plain wrong. ** his nomination for the oklahoma music hall of fame without election in 2005 is clearly a blot on that group's reputation. but it's probably not a good week to push that cart.